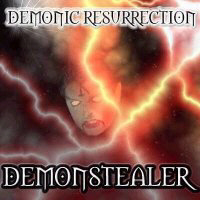 Demonic Resurrection is a power/death/black metal band from India. In 6 years as a band, DR has self-produced and released two full-length albums and been featured on numerous split-CDs and compilations worldwide. DR is backed by Demonstealer Records, Barcode Entertainment and Demonic Studios. Right from its inception in early 2000, DR has been raising eyebrows. The band had a very unstable lineup till 2003; the Demonstealer (guitars, vocals) remains the only member of the original team. Rising above its unsteady beginnings, DR was reborn that same year, it’s entity stronger than ever. With the Demonstealer on guitars and vocals, Husain on bass, Mephisto on keys and JP on drums, DR scrapped the old material and composed songs that successfully took on several genres; creating the type of music they term ‘Demonic Metal’. In 2006, Pradeep (Infernal Wrath, Disembodied Corpse) joined the band as lead guitarist.